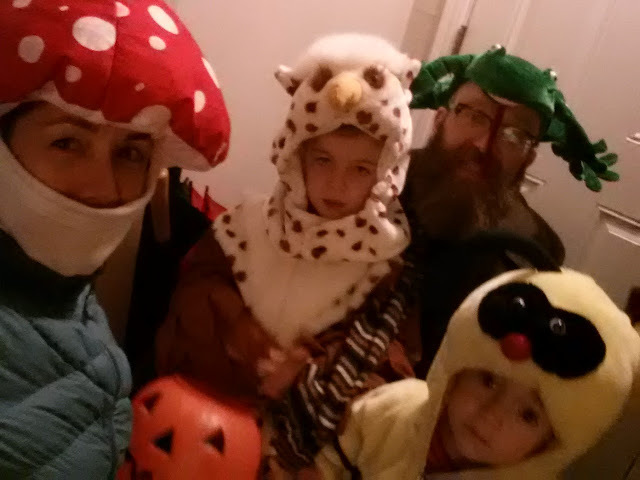 Every year since Linnaeus could walk, we've gone trick-or-treating at Halloween. The first year, we only went to a few houses on our way to a house party--he was only 14 months old, after all--netting us a reasonable amount of chocolates he could eat & a few for us. 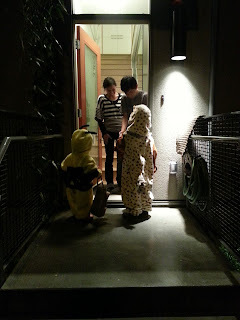 The next year, we went to some of the houses in our neighbourhood. The block we live on has a handful of homes that decorate with fake cobwebs & plastic spiders, jack-o-lanterns & orange lights, but the majority don't even give out candy. This means that the few children who do knock on the doors get showered with handfuls of treats. The year Linny was three, his haul, though not from all that many houses, was a bit ridiculous. We "took care of" some of it without him noticing, but the bucket of sugary stuff lasted a long time. Last year, we discovered a great option to cut down the stash & boy did we need to. This was Bronte's first year actively participating in the holiday. She was walking, starting to talk, & excited to be dressed up as a bat. Linnaeus & Bronte both loved trick-or-treating & did not want to stop knocking on doors. Enter the Switch Witch. I can't remember where I heard about her--Pinterest? Facebook? Twitter?--but I thought it was a brilliant idea immediately. Basically, the Switch Witch will come to your house the day after Halloween & trade your child a toy for some of their candy. We got Linnaeus to sort out the candy he wanted to give to her & he actually picked out about half of his stash. We had him leave the offering in a big bowl on the kitchen table. When he woke up on November 2, he went into the kitchen to find a little Lego set sitting in the bowl on the table. 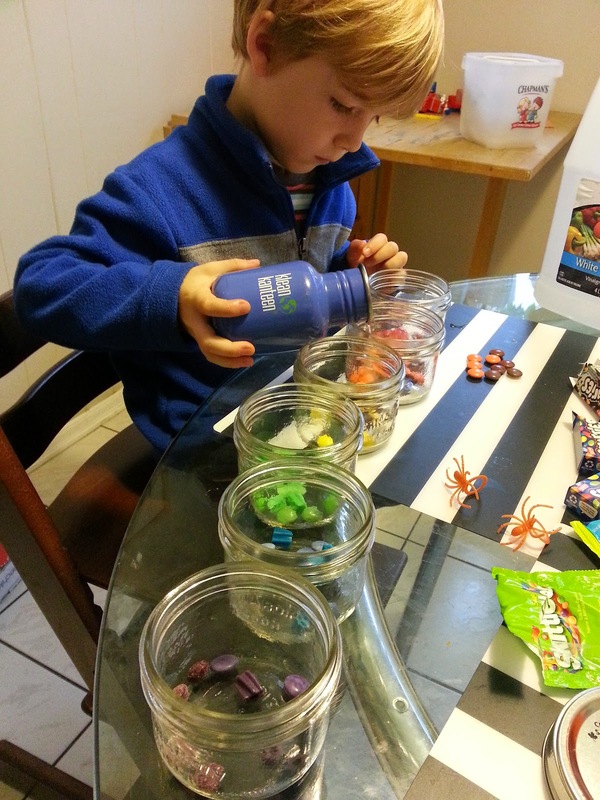 He was pretty happy with the trade & we got rid of a lot of his candy. This year after our two adorable children went from house to house in their fuzzy Halloween costumes, we ended up with a huge stash of candy. My concern this year is what to do with the candy that they sort out for the Switch Witch. Last year, we hid it in a cupboard & ate it bit by bit after they were in bed. But this year, I don't want it around. Most of the treats are really cheap chocolate or just sugary artificially coloured crap. Since I've been eating better, I do indulge in treats fairly often, but I try to go for better quality stuff like higher end chocolate or homemade cookies when I do. Last year we took many of the more brightly coloured candies & did some experiments to get the colours out of them, in conjunction with a project Linnaeus was working on with his preschool. I've also seen art projects using the dyes from candies like Skittles, so maybe we'll try something like that this year. What about you? Do you take your kids trick-or-treating? If they end up with a massive stash of candy, how do you deal with it?